This is the time of year when some varieties of basil like large leaf, purple and red varieties start to look straggly and weak. Leaves may start to discolor and drop, leaving a blank spot in the garden and few leaves for late season pesto. There are some varieties, however, that stay attractive throughout the season right up to the first frost. One of these is Greek Columnar Basil. It is a dense 24 to 30 inch plant that does not bolt and maintains a fresh green color and delightful taste. Columnar basil plants can be grown as a small hedge or border plant or individually in the ground or containers. Because this variety does not bloom, no deadheading is required to keep it full. Growth is steady and harvested leaves are quickly replaced. 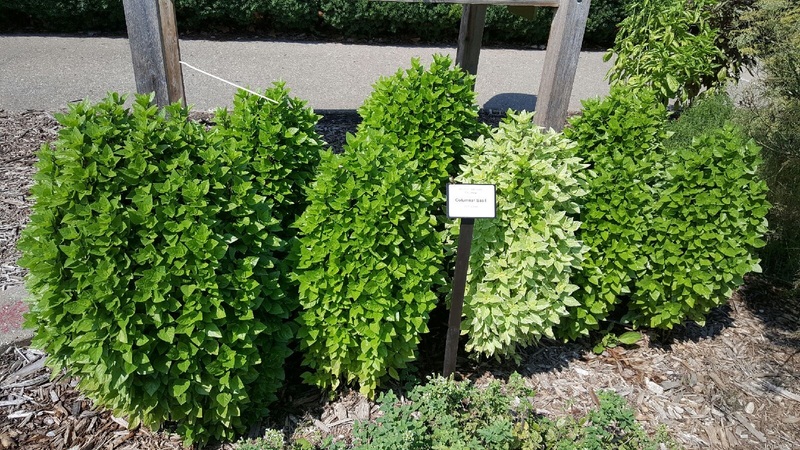 A similar plant is Pesto Perpetua Basil, which has beautiful variegated leaves and grows to the same size and in the same shape as Greek Columnar Basil. 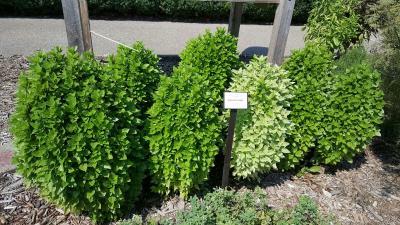 Both varieties of basil plants are in the University of Illinois Extension Herb Demonstration Garden at the Illinois State Fairgrounds, Springfield, Illinois.